There are several powerful modules that ship together with RSS Factory PRO. All these modules have a lot of configuration options that allow you to display the feed content as flexible as you need. On the left you can see some of the possibilities, but the combinations are so many that we could not fit them in this page. There are basically three modules that get installed, but by creating copies of them (in joomla admin / modules / duplicate) you can configure them independently and customize their look to your needs. You can display top Voted News from one, several or all categories. 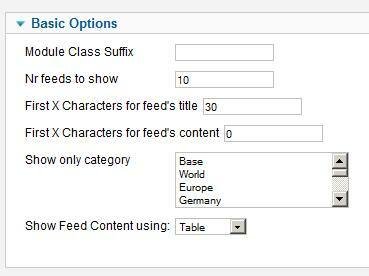 Also you can configure the way feeds are displayed. There are several ways the feeds can be displayed - Sliders,Tabbed, draggable divs, Tiled or simple list.